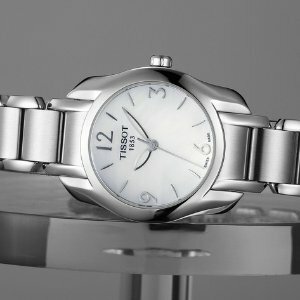 JomaShop.com offers the lowest price TISSOT T-Wave Mother of Pearl Dial Ladies Watch T023.210.11.117.00 for $99.99 via coupon code DMOONVDTT40 . Features: Stainless steel case with a stainless steel bracelet. Fixed stainless steel bezel. Mother of pearl dial with silver-tone hands and index hour markers. Arabic numerals mark the 3, 6, 9 and 12 o'clock positions.Quartz movement. Scratch resistant sapphire crystal. Solid case back. Case dimensions: 26 mm x 28 mm. Case thickness: 7.95 mm.Water resistant at 30 meters / 100 feet.